Several weeks ago, Lisa, at Zebra Designs & Destinations (& playamart) started a delightful artistic activity – Time Out For Art – every Thursday. All who enjoy (or want to try their hand at this creative and relaxing activity) pick up a pencil and sketch, then share their pencil drawings by linking to her weekly Time Out For Art post. As a result of this gathering of artistic activity, I’ve decided to spend more time drawing. I’ve rediscovered just how much I enjoyed sketching, something I’ve done very little of, in recent years. A few weeks ago there was a dandelion plant thriving in the lawn. Prior to it’s removal I sat down and sketched it. I sketched very quickly. There was a bee on one of the dandelion flowers. I used just a few placement lines and circles for the the initial layout, the bee did not hang around long. Then I sketched in more details (the bee long gone by now), went inside to refine a little more of the detail and shading. It was overly ambitious of me, afterwords I realized there was just too much detail for me to do it justice as a true pencil sketch (and too little time as well). So I shaded in various grasses and dandelion petals and bee and then to bring out a little more detail, I pen and inked in some of the sections and added a smidgen of color. So not truly a “pencil sketch”. Next week I’m going for a more stand alone object so I can really focus on the shading detail of a less complex subject! So there you have it. To some a weed, to me a dandelion wildflower, to the bee, nourishment! p.s.- if you look real close, there is a dandy ‘lion’s’ face peaking out from the left upper most dandelion flower in the sketch! Thanks for stopping by, be sure to enjoy your day today! 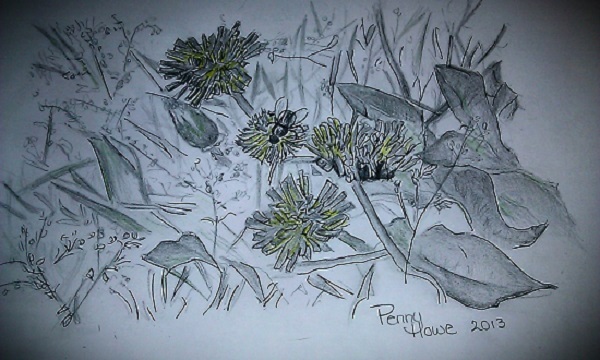 Beautiful Penny, your drawing has so much detail and love the color in it, I am glad you see beauty in everything, dandelions are so pretty but often overlooked ;). Love the splash of unexpected color. Awesome!!! Thank you, honestly I was more than a little frustrated that I couldn’t bring out what I wanted to, without the color. Dandelions are so very yellow aren’t they, lol! That’s really lovely, Penny. I like the little spray of flowers at the bottom and top left too. I’d love to be able to drawer. You are so talented, Penny! Ha – Love how you added a lion to the dandy sketch! I love this. I was looking at it as I was reading, and thinking “That looks like a face” 😆 You are so talented in so many ways my friend. i love it, penny! we see so much more, as you know, when we record with pencil (or pen or paint) and not with the camera. we also anchor memories to those drawings and reopen those memories when we view the work years later. you did a great job, even if the bee was suddenly struck with a case of bashfulness! where do you find the time for all these challenges.? ?